Fwd: URGENT! Membership rechartering and annual dues – please handle by 11/5, but no later than 11/19 | "Building tomorrow’s leaders, today!" This is a reminder about annual membership renewal. Please see below and complete the attached form. Troop Treasurer’s (Mr. Dunning and Mr. Valley) have a list of OA members if you wish to pay your 2019 Lodge dues via a group payment from the Troop, otherwise you will be responsible to do so yourself. Thank you. 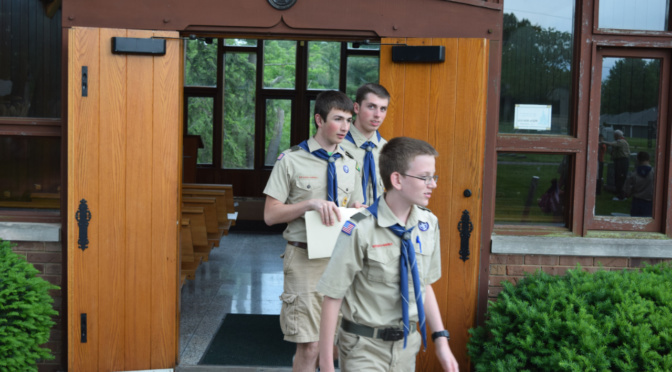 Each year the troop must renew its membership charter with the Council. Scouts and registered adults have a yearly fee of $33 for membership renewal (re-charter). Each scout is also responsible for dues which are $10 per quarter. Scouts may pay for the entire year up front or on a quarterly basis. You may also elect to update your scout’s Boy’s Life subscription and pay 2019 OA Lodge dues. Your scout may elect to have the funds deducted from their scout account (part of pay your own way). Re-charter fee for adults and scouts along with first quarter dues are *due by Monday, November 19th*. Please fill out the lower portion of the attached form with your choices and turn in with payment at the 11/5 and 11/19 troop meetings. Scout account balance information is available by replying to this email or asking Steve Dunning/Tim Valley at the Troop meeting for their current balance. If you are a registered adult and have received email notification that your Youth Protection Training (YPT) is scheduled to expired on or after January 1, 2019, you MUST take the new YPT, otherwise the online rechartering system will not allow you to recharter as an adult. Please update your training as soon as possible to ensure your recharter status is accepted by the Council. Go to www.my.scouting.org to complete the online training.